The movie has several sub-plots but here’s the central storyline: Bruce Wayne has turned recluse for eight years, after Batman takes the blame for Harvey Dent. Wayne Enterprises is failing. Bane turns up apparently out of nowhere and instigates a rebellion against the upper classes that deprives Gotham City of nearly its entire police force and brandishes the threat of nuclear destruction over the heads of the populace. I have mixed opinions about the movie. It is a technically good movie – I can’t find any huge defects in the technical aspects of it. There are ideas and concepts presented which do merit thought and discussion – such as how things founded on lies will eventually crumble, the nature of heroism, the effectiveness of the legal system, anarchy, and implications of nuclear power, etc. But I didn’t like it very much. The story is propelled mostly by the Bruce Wayne and his still-growling alter ego Batman (Christian Bale) and his equally growly-voiced antagonist, Bane (Tom Hardy), with some help from the slinky Catwoman (Anne Hathaway) and contributions from old standards Alfred (Michael Caine, who didn’t get enough screen time for my liking), Commissioner Gordon (Gary Oldman) and Lucius Fox (Morgan Freeman). But it really required the stability and sensibility of new character Officer John Blake (Joseph Gordon Levitt, astounding me yet again, as he did in Inception) to give the story the turbo boost of spirit and the heart that it sorely required. Nolan knows how to present a riveting story, and he displays his skill at storytelling once more in TDKR. The twists and turns of the story are well done and they do keep you on the edge of your seat. But there were one too many scenes of violence and destruction for my taste. They compounded the feeling of bleak hopelessness edged with terror and the sense of impending doom in the film, which was only underscored by Hans Zimmer’s thundering, thumping music – particularly effective was the ominous chanting vocal bit that appears to be the theme for Bane’s rebellion. 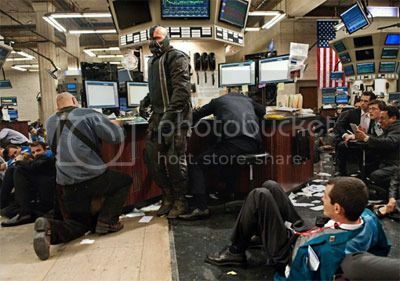 A number of reviews have likened Bane’s rebellion to the Occupy movement, and I think they’re right – it is very much like the Occupy movement, and the French Revolution and the Chinese Cultural Revolution, with its obvious parallels to the “99%” versus the “1%”, or the “commoners” versus the “upper class”. It is so similar that it’s almost painful and frightening in its similarity, because I could imagine a rebellion as chaotic as that happening in reality, given that it is now comparatively easy for people (with money and connections) to acquire firearms today. You see pictures of rebel armies in the news and they’re not so very different from the rebels led by Bane in the movie. The main difference is that the rebels of TDKR have a leader who is built like a wrestler and who wears a nightmarish mask over his face. Sociopolitical commentary aside, the rebellion in the movie appeared problematic to me. Their motivation at first seems to be one of overthrowing the upper class of Gotham City. But it’s later revealed that it’s all part of Ra’s al Ghul’s ultimate plan. Or something. I didn’t understand it. Why Gotham City in particular? Okay, maybe I’m just underestimating Gotham’s importance in the Batman universe. Maybe it’s their version of New York or London or something. But I didn’t see the importance of choosing Gotham. A bigger problem was this: If they were going to try and reclaim the city “for the people”, then why set up a nuclear bomb that can’t be disabled and will certainly go off in five months and make sure that no one – not even the rebellion leaders – will be able to leave the city? So you overthrow the rich, take their stuff, and then you die. And kill everyone else in the city as well, rich and poor alike. Huh? What? Why? This made zero sense. Ra’s al Ghul, you didn’t think your plan through, did you? The light in the depressing darkness of this movie really was John Blake. For a film that is ostensibly about Batman, Batman hardly seemed like the hero to me for much of it. It is Blake’s visit to Bruce that prompts Bruce to get out into the world again and find out exactly what is going on. Blake continues to play an important part in the story, especially when Bane takes over Gotham City shortly after defeating and imprisoning Batman far away in a deep pit where Bane himself was once incarcerated. (Huh. Lots of Bs in here: Bruce, Batman, Blake, Bane.) John Blake moves into the limelight, as he and Commissioner Gordon and the few remaining members of the police force struggle to keep tabs on the situation in Gotham and find a way out whilst lying low, away from the rebels and their kangaroo court that sentences people to death. Then when Batman finally returns (who knew a broken back could heal completely in mere months? ), it’s Blake whom he charges with the evacuation of the people of Gotham. Of course, ultimately Batman is the hero of the day when he saves the city by taking the nuclear bomb out over the ocean before it detonates. But if Blake hadn’t gone to Bruce Wayne, if he hadn’t believed in Batman, if he hadn’t kept his wits about him when the rebellion broke out in earnest, if he hadn’t gone to get the Commissioner… if there was no John Blake, this story might have turned out quite differently. Ah, that reminds me. The nuclear bomb. The minute they began throwing around terms like “sustainable energy” and “nuclear bomb”, a sensation of déjà vu descended. It sounded too familiar. Wayne Enterprises has a nuclear fusion reactor of some sort that could be a sustainable power source – or it could be a nuclear bomb. Later Bane takes control of it and has it turned into a time bomb that will level Gotham City in months. They are unable to disable the bomb and the only way out is for Batman to hop into his latest flying vehicle and take the bomb out to sea with him, far enough that the city will be safe. It’s essentially a suicide mission. There are strong similarities in The Avengers, though not arranged in the same manner: Stark Enterprises has built Stark Tower, a tower rigged to run on its own sustainable power source. Loki seizes control of it and makes it the focal point of his alien army invasion (though he doesn’t bother about the sustainable power part at all; he just wants to make a grand entrance). The government, seeing no way out, sends in a nuclear missile, and Iron Man is the only one who can get rid of it – and he takes it up with him through the portal to the invading world. It’s essentially a suicide mission. The “bomb threat with the hero sacrificing himself to dispose of the bomb” is turning into such a cliché. It happened in Captain America, it happened in Avengers, and it happened again in TDKR. I’m trying to be as neutral as I can here, but if one compares all three then the only one who actually truly sacrificed himself – or sacrificed anything – is Captain America. Batman “died” and so did Bruce Wayne. But the man himself did not die. Only his identity did. At the end we learn that Bruce (or whatever name he’s going by) is living a happy life away from Gotham City and away from the psychological shackles that he had before. He has a happy ending. What, then, did he sacrifice? I’m getting carried away. Yes, the manner of Batman’s demise is perhaps clichéd, and I think it would have been stronger (albeit more depressing) if Bruce Wayne had actually died instead of merely faking his death. 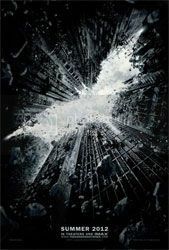 But at the same time, the “death” of Batman is probably a fitting end to Nolan’s trilogy. It brings it full circle. Nolan did manage to have one thing that I really liked though. 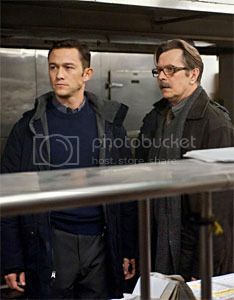 Towards the end of the movie, John Blake goes to the reading of Bruce Wayne’s will. After it he asks if there’s anything for him, and the woman says no. He says, “Try my legal name,” and hands her a card. She checks, and yes, there is some stuff for him after all. She tells him that he should use his full name, it’s nice. His legal name is Robin. I have to hand it to Nolan. He found a way to circumvent the almost kiddish and silly aspect of Robin and instead has presented us with an excellent example of how to update a comic book sidekick and make him every bit as interesting as the hero. He’s even put a cool little spin on it, implying that Robin will take over and become Batman. * The final scene in the movie shows Blake locating the waterfall entrance to the Batcave and going in. He steps on the platform in the cave… and it rises. * Not sure if this happens in the comic books or not.